❤-Output power: 4.0 Peak HP / Voltage 110/120V. ❤-Advanced designed for lower noise,Four layer noise reduction device at air inlets. ❤-Spring hose and 3 nozzles , Use different nozzles are able to make different shapes for pets. You can now save time, money, and enjoy washing and drying your dogs at home, making for happier, stress-free pets. You can be used to de-shed your dog's coat and even has the ability to give a light massage that your pup will love. When you purchase the Dog Dryer,Save time and take care of last minute emergencies caused by rainy weather, dirty hiking trails and dips in the pool. Can also be used to blow dirt from your dog's coat without a wash. No more towels and hair dryers. Dogs have immense trust in their owner, washing and drying your pet increases the natural bond between you and your dog. Drying at home can save you time and reduce anxiety for your dog, since your dog will remain with you at the house. A visit to the groomer can put a dent into your wallet and cost you valuable personal time. 【Amazing Force】Compared to handheld hair dryers our dryer reduces time by over 50%, saving your precious time, especially when grooming large dogs. 【Temperature】Because of the unique temperature settings of 81*F to 160*F and the steady air flow, hair will dry faster with less damage. Great for winter! 【Speed】The adjustable speed dial from 4921FPM-44000FPM makes it great for controlling noise levels especially when grooming sensitive dogs. 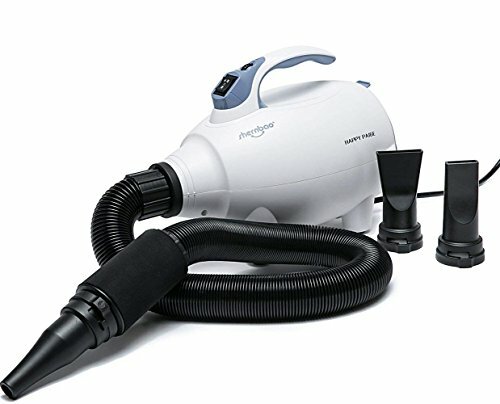 【Accessories】Includes 10ft flexible hose, 3 different nozzles and 2 air filters. 【Warranty/replacement】Has a 12month warranty. If there's any thing wrong with the product please email us, so we can fix or replace it. If you have any questions about this product by SHERNBAO, contact us by completing and submitting the form below. If you are looking for a specif part number, please include it with your message.